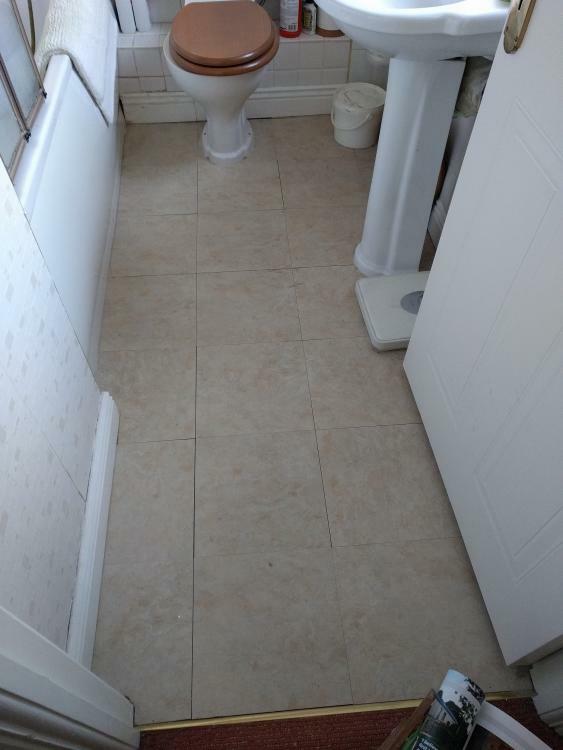 Will I have to remove the toilet and wash basin? Or can I cut tiles around them? What should I place on top of the timber floor and beneath the tiles - plywood? One big strip or layers? Anything else? Is it ok to tile up to the existing skirting and finish with silicone? Should I remove or trim the skirting to get tiles underneath? Porcelain, textured tiles I hear are best to provide some grip on a wet surface? Any tile recommendations? I think that's it - this will give me an idea of what I'm taking on or if I need to grow more hair first....!! Will I have to remove the toilet and wash basin? Or can I cut tiles around them? - Remove and replace. What should I place on top of the timber floor and beneath the tiles - plywood? One big strip or layers? Anything else? I would do ply, once piece of practical glued and screwed. Is it ok to tile up to the existing skirting and finish with silicone? Should I remove or trim the skirting to get tiles underneath? Remove skirting. My thoughts - others will be along shortly! Look at the job like an onion, from which you are about to start peeling off layers. What you do will be affected by what water damage or wear and tear the room has suffered since being put in. You lift the flooring and take the skirting off, the boxing in is shot so that's got to come off, sink and WC must come off / out to do this work properly , then the wall tiles come loose and on it goes. Thats a pessimistic view, but often the case I'm afraid. I've been doing these type of jobs for around 23 years so now know not to even start one like yours when the customer says "I just want to do the floor, and NOTHING else", ( as that's when to run away ). You may be lucky and it goes much smoother, but when you mention things have had a drink or two the alarm bells start ringing. From the pics it looks like your skirting is over the flooring, so take that off first and see if that's gone incident free. Use a multi-tool too cheap to struggle on without one, don't forget to buy spare blades to cut it into small sections so it comes off easier and then plan the new skirting so the cut / joint lands behind the WC and out of sight. Youll need plywood, a min of 9mm over floorboards or 6mm over Weyrock. Either deck will need to be screwed down tight prior to overlaying the plywood, so brings a new nightmare of what are you about to screw through. If if I were you, I'd look at some of the really nice new vinyl click flooring that's available as it's a much easier route to an equally nice job, plus the tiles will be much colder underfoot. You apply a bit of clear silicone to the joints as you lay to waterproof them so the floor doesn't suffer the same fate. If you definitely want tiles, get the sink and toilet out and lift the existing flooring and let's see what's underneath and we can advise from there. Have you done tiling before? Is this your only bathroom? I would reconsider the tiles. To get a good job will be a lot of work and then you'll wish you had put in undertile heating, then you'll want the suite replaced! I would seriously look into a good quality tile effect floor, which will look just as good and be many times quicker to lay. Thanks - not sure how much of a can of worms I want to open here yet so I'll check out the vinyl click flooring for sure and try to avoid drilling through any pipes!! Cheers.